By Steve McKenna, The West Australian, September 2, 2013: "Visiting in 1830, a young Benjamin Disraeli - future prime minister of Great Britain - declared Valletta "a city of palaces built by gentlemen for gentlemen". The Maltese capital, he said, "equals in its noble architecture, if it does not excel, any capital in Europe". Like Mr Disraeli - who came to Malta on a recommendation from his late friend, the poet Lord Byron - I'm instantly won over by Valletta. And I haven't even set foot in it yet. The city crowns a rocky peninsula jutting into the bluey-green Mediterranean Sea, and its flurry of baroque domes and spires poke above an imposing loop of fortified walls and watchtowers, which, like many of the buildings on the Maltese archipelago, are formed from the local, honey-toned limestone. Many travellers enjoy their first, unforgettable glimpse of Valletta from a cruise ship, with large ocean-going liners docking at the Grand Harbour, the naturally deep port to the city's east, which has attracted seafarers since Phoenician and Roman times. I'm on the little public ferry that regularly buzzes back and forth across Marsamxett Harbour, which connects the western flank of Valletta with Sliema, a seaside town where oodles of holidaymakers, myself included, base themselves for a Maltese adventure. 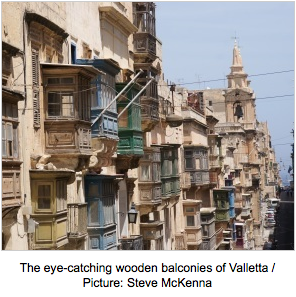 Bewitching from a distance, Valletta is a corker up close. Unlike many UNESCO World Heritage-listed sites, it's not a sedate open-air museum, and offers an enchanting blend of historic signposted sights and intriguing backstreets, where Maltese go about their everyday business (think: market traders hawking fruit and veg and soccer shirts, old ladies sweeping pavements and men puffing cigars and nattering in Maltese - a language that sounds like a...read on."